Oops! I actually made a mistake with my count and forgot to put up Inktober Day 22. My bad! I'll have to put it up tomorrow. For other news, here's a Sea Cow! Yay! 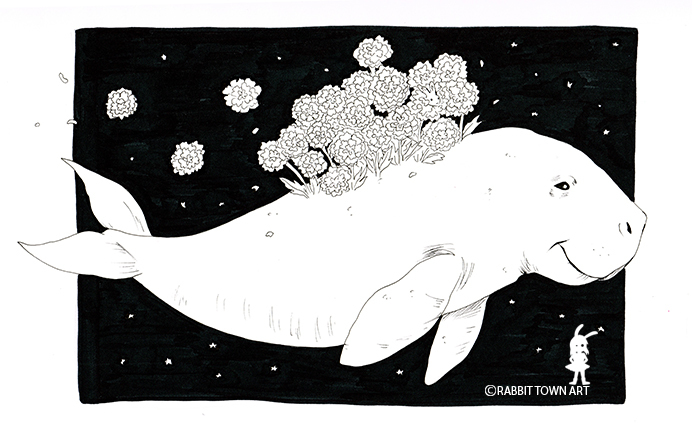 Lots of people wanted a Dugong. Not sure why but it's drawn up! First day at work at a new company today and it was good fun! The day didn't start out that well though with Rob and I getting a flat tire first thing in the morning. Boo! I wasn't late on my first day though and my stuff was all set-up, we got treated out to lunch, overall, a very good day! Inktober Day 31: Bunnies Frolicking!